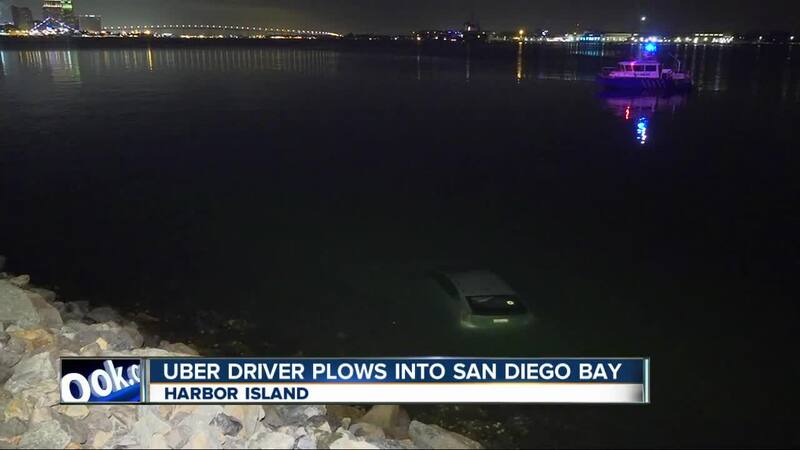 SAN DIEGO — An Uber driver escaped from his car after it plunged into San Diego Bay Thursday night. San Diego Harbor Police said the incident occurred at around 10:30 p.m. local time. The driver was on his way to pick up a customer on Harbor Island when he arrived at a T-intersection at a high rate of speed, causing him to drive off the road and into the water. According to police, the driver was trapped in the vehicle as it began to sink. He tried opening the door as water began to fill his car, but his seatbelt was still on. When the driver was able to release his seatbelt, he noticed the door had shut and was stuck. He forced his way out of the car through a broken window and swam to shore. Several passersby helped the man from the water as authorities arrived. The driver was found not to be under the influence; he told police he tried to make a turn but it was too late. A crane was able to remove the car from the water about two hours later. The driver was taken to the hospital for treatment.